Angiotensin-converting enzyme (EC 3.4.15.1), or ACE, is a central component of the renin-angiotensin system (RAS), which controls blood pressure by regulating the volume of fluids in the body. It converts the hormone angiotensin I to the active vasoconstrictor angiotensin II. Therefore, ACE indirectly increases blood pressure by causing blood vessels to constrict. ACE inhibitors are widely used as pharmaceutical drugs for treatment of cardiovascular diseases. The enzyme was discovered by Leonard T. Skeggs Jr. in 1956. It is located mainly in the capillaries of the lungs but can also be found in endothelial and kidney epithelial cells. Other less known functions of ACE are degradation of bradykinin and amyloid beta-protein. 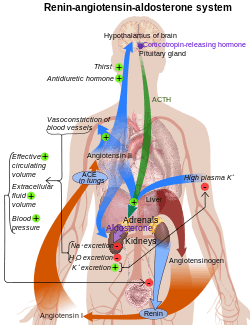 Anatomical diagram of the renin-angiotensin system, showing the role of ACE at the lungs. ACE hydrolyzes peptides by the removal of a dipeptide from the C-terminus. Likewise it converts the inactive decapeptide angiotensin I to the octapeptide angiotensin II by removing the dipeptide His-Leu. Angiotensin II is potent vasoconstrictor in a substrate concentration-dependent manner. Angiotensin II binds to the type 1 angiotensin II receptor (AT1), which sets off a number of actions that result in vasoconstriction and therefore increased blood pressure. ACE is also part of the kinin-kallikrein system where it degrades bradykinin, a potent vasodilator, and other vasoactive peptides. Kininase II is the same as angiotensin-converting enzyme. Thus, the same enzyme (ACE) that generates a vasoconstrictor (ANG II) also disposes of vasodilators (bradykinin). ACE is a zinc metalloenzyme. The zinc ion is essential to its activity, since it directly participates in the catalysis of the peptide hydrolysis. Therefore, ACE can be inhibited by metal-chelating agents. The E384 residue was found to have a dual function. First it acts as a general base to activate water as a nucleophile. Then it acts as a general acid to cleave the C-N bond. The function of the chloride ion is very complex and is highly debated. The anion activation by chloride is a characteristic feature of ACE. It was experimentally determined that the activation of hydrolysis by chloride is highly dependent on the substrate. While it increases hydrolysis rates for e.g. Hip-His-Leu it inhibits hydrolysis of other substrates like Hip-Ala-Pro. Under physiological conditions the enzyme reaches about 60% of its maximal activity toward angiotensin I while it reaches it's full activity toward bradykinin. It is therefore assumed that the function of the anion activation in ACE provides high substrate specificity. Other theories say that the chloride might simply stabilize the overall structure of the enzyme. The ACE gene, ACE, encodes two isozymes. The somatic isozyme is expressed in many tissues, mainly in the lung, including vascular endothelial cells, epithelial kidney cells, and testicular Leydig cells, whereas the germinal is expressed only in sperm. Brain tissue has ACE enzyme, which takes part in local RAS and converts Aβ42 (which aggregates into plaques) to Aβ40 (which is thought to be less toxic) forms of beta amyloid. The latter is predominantly a function of N domain portion on the ACE enzyme. ACE inhibitors that cross the blood–brain barrier and have preferentially selected N-terminal activity may therefore cause accumulation of Aβ42 and progression of dementia. 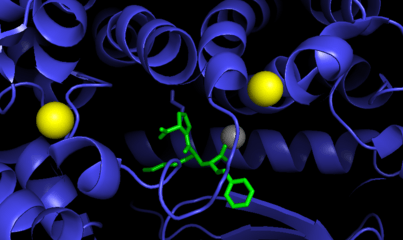 ACE in complex with inhibitor lisinopril, zinc cation shown in grey, chloride anions in yellow. Based on PyMOL rendering of PDB 1o86 The picture shows that lisinopril is a competitive inhibitor, since it has a similar structure to angiotensin I and binds to the active site of ACE. ACE inhibitors are widely used as pharmaceutical drugs in the treatment of conditions such as high blood pressure, heart failure, diabetic nephropathy, and type 2 diabetes mellitus. ACE inhibitors inhibit ACE competitively. That results in the decreased formation of angiotensin II and decreased metabolism of bradykinin, which leads to systematic dilation of the arteries and veins and a decrease in arterial blood pressure. 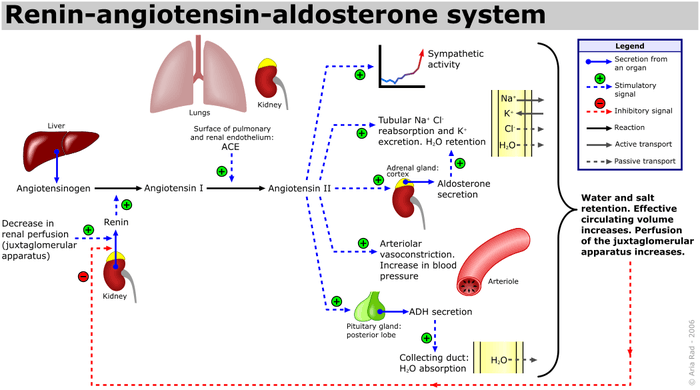 In addition, inhibiting angiotensin II formation diminishes angiotensin II-mediated aldosterone secretion from the adrenal cortex, leading to a decrease in water and sodium reabsorption and a reduction in extracellular volume. ACE's effect on Alzheimer's disease is still highly debated. Alzheimer patients usually show higher ACE levels in their brain. Some studies suggest that ACE inhibitors that are able to pass the blood-brain-barrier (BBB) could enhance the activity of major amyloid-beta peptide degrading enzymes like neprilysin in the brain resulting in a slower development of Alzheimer's disease. More recent research suggests that ACE inhibitors can reduce risk of Alzheimer's disease in the absence of apolipoprotein E4 alleles (ApoE4), but will have no affect in ApoE4- carriers. Another more recent hypothesis is that higher levels of ACE can prevent Alzheimer's. It is assumed that ACE can degrade beta-amyloid in brain blood vessels and therefore help prevent the digression of the disease. Elevated levels of ACE are also found in sarcoidosis, and are used in diagnosing and monitoring this disease. Elevated levels of ACE are also found in leprosy, hyperthyroidism, acute hepatitis, primary biliary cirrhosis, diabetes mellitus, multiple myeloma, osteoarthritis, amyloidosis, Gaucher disease, pneumoconiosis, histoplasmosis, miliary tuberculosis. Serum levels are decreased in renal disease, obstructive pulmonary disease, and hypothyroidism. Studies have shown that different genotypes of angiotensin converting enzyme can lead to varying influence on athletic performance. ACE I/D polymorphism consists of either an insertion (I) or absence (D) of a 287 base pair alanine sequence in intron 16 of the gene. People carrying the I-allele usually have lower ACE levels while people carrying the D-allele have higher ACE levels. People carrying the D-allele are associated with higher ACE levels that cause higher levels of angiotensin II. During physical exercise the blood pressure of D-allele carriers will therefore increase sooner than for I-allele carriers. This results in a lower maximal heart rate and lower maximum oxygen uptake (VO2max). Therefore, D-allele carriers have a 10% increased risk of cardiovascular diseases. Furthermore, the D-allele is associated with a greater increase in left ventricular growth in response to training compared to the I-allele. On the other hand, I-allele carriers usually show an increased maximal heart rate due to lower ACE levels, higher maximum oxygen uptake and therefore show an enhanced endurance performance. The I allele is found with increased frequency in elite distance runners, rowers and cyclists. Short distance swimmers show a higher occurrence of D-allele carriers in their specific discipline, since their discipline relies more on strength than endurance. ↑ "Drugs that physically interact with Angiotensin-converting enzyme view/edit references on wikidata". ↑ Skeggs LT, Kahn JR, Shumway NP (Mar 1956). "The preparation and function of the hypertensin-converting enzyme". The Journal of Experimental Medicine. 103 (3): 295–9. doi:10.1084/jem.103.3.295. PMC 2136590 . PMID 13295487. ↑ Kierszenbaum, Abraham L. (2007). Histology and cell biology: an introduction to pathology. Mosby Elsevier. ISBN 0-323-04527-8. ↑ Fillardi P (2015). ACEi and ARBS in Hypertension and Heart Failure. Volume 5. Switzerland: Springer International Publishing. pp. 10–13. ISBN 978-3-319-09787-9. ↑ Hemming ML, Selkoe DJ (Nov 2005). "Amyloid beta-protein is degraded by cellular angiotensin-converting enzyme (ACE) and elevated by an ACE inhibitor". The Journal of Biological Chemistry. 280 (45): 37644–50. doi:10.1074/jbc.M508460200. PMC 2409196 . PMID 16154999. 1 2 Boulpaep EL, Boron WF (2005). "Integration of Salt and Water Balance". Medical Physiology: a Cellular and Molecular Approach. Philadelphia, Pa.: Elsevier Saunders. pp. 866–867. ISBN 978-1-4160-2328-9. ↑ Coates D (Jun 2003). "The angiotensin converting enzyme (ACE)". The International Journal of Biochemistry & Cell Biology. Renin-Angiotensin Systems: State of the Art. 35 (6): 769−73. doi:10.1016/S1357-2725(02)00309-6. PMID 12676162. ↑ Zhang R, Xu X, Chen T, Li L, Rao P (May 2000). "An assay for angiotensin-converting enzyme using capillary zone electrophoresis". Analytical Biochemistry. 280 (2): 286–90. doi:10.1006/abio.2000.4535. PMID 10790312. ↑ Imig JD (Mar 2004). "ACE Inhibition and Bradykinin-Mediated Renal Vascular Responses: EDHF Involvement". Hypertension. 43 (3): 533–5. doi:10.1161/01.HYP.0000118054.86193.ce. PMID 14757781. ↑ Wang W, McKinnie SM, Farhan M, Paul M, McDonald T, McLean B, Llorens-Cortes C, Hazra S, Murray AG, Vederas JC, Oudit GY (May 2016). "Angiotensin Converting Enzyme 2 Metabolizes and Partially Inactivates Pyrapelin-13 and Apelin-17: Physiological Effects in the Cardiovascular System". Hypertension. doi:10.1161/HYPERTENSIONAHA.115.06892. PMID 27217402. ↑ Bünning P, Riordan JF (Jul 1985). "The functional role of zinc in angiotensin converting enzyme: implications for the enzyme mechanism". Journal of Inorganic Biochemistry. 24 (3): 183–98. doi:10.1016/0162-0134(85)85002-9. PMID 2995578. 1 2 3 Zhang C, Wu S, Xu D (Jun 2013). "Catalytic mechanism of angiotensin-converting enzyme and effects of the chloride ion". The Journal of Physical Chemistry B. 117 (22): 6635–45. doi:10.1021/jp400974n. PMID 23672666. 1 2 Bünning P (1983). "The catalytic mechanism of angiotensin converting enzyme". Clinical and Experimental Hypertension. Part A, Theory and Practice. 5 (7-8): 1263–75. doi:10.3109/10641968309048856. PMID 6315268. ↑ "Angiotensin converting enzyme (ace) inhibitors" (PDF). British Hypertension Society. ↑ Klabunde RE. "ACE-inhibitors". Cardiovascular Pharmacology Concepts. cvpharmacology.com. Retrieved 2009-03-26. ↑ Brooks L (2004). "The Importance of Treating the Blood Pressure: ACE Inhibitors May Slow Alzheimer's Disease". Medscape. Medscape Cardiology. ↑ Qiu WQ, Mwamburi M, Besser LM, Zhu H, Li H, Wallack M, Phillips L, Qiao L, Budson AE, Stern R, Kowall N (2013-01-01). "Angiotensin converting enzyme inhibitors and the reduced risk of Alzheimer's disease in the absence of apolipoprotein E4 allele". Journal of Alzheimer's Disease. 37 (2): 421–8. doi:10.3233/JAD-130716. PMC 3972060 . PMID 23948883. ↑ "ACE Enzyme May Enhance Immune Responses And Prevent Alzheimer's". Science 2.0. Retrieved 2016-03-01. ↑ Wang P, Fedoruk MN, Rupert JL (2008). "Keeping pace with ACE: are ACE inhibitors and angiotensin II type 1 receptor antagonists potential doping agents?". Sports Medicine. 38 (12): 1065–79. doi:10.2165/00007256-200838120-00008. PMID 19026021. 1 2 Montgomery HE, Clarkson P, Dollery CM, Prasad K, Losi MA, Hemingway H, Statters D, Jubb M, Girvain M, Varnava A, World M, Deanfield J, Talmud P, McEwan JR, McKenna WJ, Humphries S (Aug 1997). "Association of angiotensin-converting enzyme gene I/D polymorphism with change in left ventricular mass in response to physical training". Circulation. 96 (3): 741–7. doi:10.1161/01.CIR.96.3.741. PMID 9264477. ↑ Sanders J, Montgomery H, Woods D (2001). "Kardiale Anpassung an Körperliches Training" [The cardiac response to physical training] (PDF). Deutsche Zeitschrift für Sportmednizin (in German). pp. 86–92. ↑ Costa AM, Silva AJ, Garrido ND, Louro H, de Oliveira RJ, Breitenfeld L (Aug 2009). "Association between ACE D allele and elite short distance swimming". European Journal of Applied Physiology. 106 (6): 785–90. doi:10.1007/s00421-009-1080-z. PMID 19458960. Niu T, Chen X, Xu X (2002). "Angiotensin converting enzyme gene insertion/deletion polymorphism and cardiovascular disease: therapeutic implications". Drugs. 62 (7): 977–93. doi:10.2165/00003495-200262070-00001. PMID 11985486. Roĭtberg GE, Tikhonravov AV, Dorosh ZV (2004). "[Role of angiotensin-converting enzyme gene polymorphism in the development of metabolic syndrome]". Terapevticheskiĭ Arkhiv. 75 (12): 72–7. PMID 14959477. Vynohradova SV (2005). "[The role of angiotensin-converting enzyme gene I/D polymorphism in development of metabolic disorders in patients with cardiovascular pathology]". T︠S︡itologii︠a︡ I Genetika. 39 (1): 63–70. PMID 16018179. König S, Luger TA, Scholzen TE (Oct 2006). "Monitoring neuropeptide-specific proteases: processing of the proopiomelanocortin peptides adrenocorticotropin and alpha-melanocyte-stimulating hormone in the skin". Experimental Dermatology. 15 (10): 751–61. doi:10.1111/j.1600-0625.2006.00472.x. PMID 16984256. Sabbagh AS, Otrock ZK, Mahfoud ZR, Zaatari GS, Mahfouz RA, et al. (Mar 2007). "Angiotensin-converting enzyme gene polymorphism and allele frequencies in the Lebanese population: prevalence and review of the literature". Molecular Biology Reports. 34 (1): 47–52. doi:10.1007/s11033-006-9013-y. PMID 17103020. Castellon R, Hamdi HK (2007). "Demystifying the ACE polymorphism: from genetics to biology". Current Pharmaceutical Design. 13 (12): 1191–8. doi:10.2174/138161207780618902. PMID 17504229. Lazartigues E, Feng Y, Lavoie JL (2007). "The two fACEs of the tissue renin-angiotensin systems: implication in cardiovascular diseases". Current Pharmaceutical Design. 13 (12): 1231–45. doi:10.2174/138161207780618911. PMID 17504232. 1o86: CRYSTAL STRUCTURE OF HUMAN ANGIOTENSIN CONVERTING ENZYME IN COMPLEX WITH LISINOPRIL. 1o8a: CRYSTAL STRUCTURE OF HUMAN ANGIOTENSIN CONVERTING ENZYME (NATIVE).